We present an interactive system for fragment-based image completion which exploits information about the approximate 3D structure in a scene in order to estimate and apply perspective corrections when copying a source fragment to a target position. Even though implicit 3D information is used, the interaction is strictly 2D which makes the user interface very simple and intuitive. We propose different interaction metaphors in our system for providing 3D information interactively. Our search and matching procedure is done in the Fourier domain and hence it is very fast and it allows us to use large fragments and multiple source images with high resolution while still obtaining interactive response times. 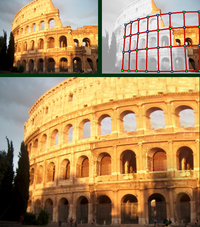 Our image completion technique also takes user-specified structure information into account where we generalize the concept of feature curves to arbitrary sets of feature pixels. We demonstrate our technique on a number of difficult completion tasks.